— How do magma reservoirs pressurize? As molten rock ascends toward the surface of a planet it often stalls for a time, forming a shallow magma reservoir if the conditions are correct. 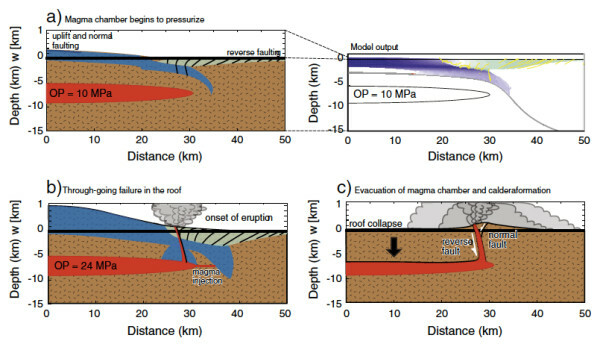 When pressurized to the point of rupture, such reservoirs act to redirect magma laterally within the subsurface or can send magma on a path toward the surface again. Understanding the conditions that drive magma reservoir failure, and predicting the characteristic pathways followed by the magma that escapes, benefits from data gathered in the field, in the lab, and via analogue and numerical models. The latter have provided important insights in the last few decades, and they have also highlighted many areas where greater research is needed. For instance, how strong is the rock surrounding a reservoir, and what conditions exist there when a large (perhaps short-lived) magma body is present? Understanding these conditions is critical if we are to understand how much pressurization is required to initiate rupture — which in turn can help us understand when, and under what conditions, a given magma system might become hazardous to nearby populations. In a paper recently published in the journal Earth and Planetary Science Letters, Dr. Patricia Gregg, Dr. Shan de Silva (colleagues from Oregon State University) and I have used temperature-dependent numerical models to explore how an adaptive reservoir boundary — which in essence takes into account how pressurization of the magma system leads to displacement of the reservoir walls and hence a decrease in magma pressure — creates a feedback loop that helps limit the total pressure that can be achieved. 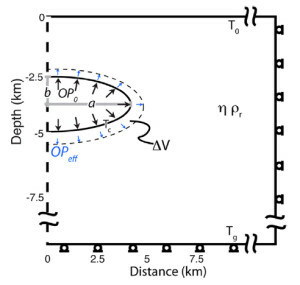 When applied to the recent inflation event at Santorini, this new model approach helps constrains the reservoir size and, intriguingly, demonstrates why external triggering mechanisms may be needed before the reservoir can fail. For more information: Gregg, P.M., S.L. de Silva, and E.B. Grosfils, Thermomechanics of shallow magma chamber pressurization: Implications for the assessment of ground deformation data at active volcanoes. Earth and Planetary Science Letters, 384, 100-108, 2013. Giant radial dike systems that on average are several hundred kilometers in radius can be found on Earth, Venus and Mars. To date, however, it has been unclear how these impressive volcanic features might originate. For such systems to form, massive quantities of magma ascending from the mantle must encounter both a stress field that favors a radial dike configuration and something that redirects ascending magma laterally at shallow depths within the lithosphere. 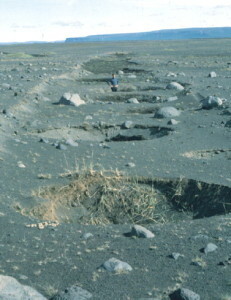 The former condition is straightforward to create via large-scale flexural uplift in response to plume impingement, underplating, or a similar mechanism; however, the stress state resulting from this process strongly favors continued ascent and eruption, inconsistent with evidence of long-distance lateral transport of magma through the radial dikes. In a paper recently published in the journal Icarus, Dr. Gerald Galgana, Dr. Patrick McGovern (colleagues from the Lunar and Planetary Institute in Houston, TX) and I have demonstrated that initial eruptions related to flexural uplift can produce a surface load (e.g., a large volcanic edifice) that acts to counter the uplift, suppressing upward flexure and simultaneously creating a stress cap of sufficient magnitude that lateral redirection of magma into radial dike systems becomes likely. This exciting new understanding links mechanical processes acting upon the lithosphere directly to the volcanological outcomes, improving our insight into the formation and evolution of some of the largest magmatic systems and radial dike swarms identified on multiple planets. For more information: Galgana, G.A., E.B. Grosfils and P.J. McGovern, 2013. 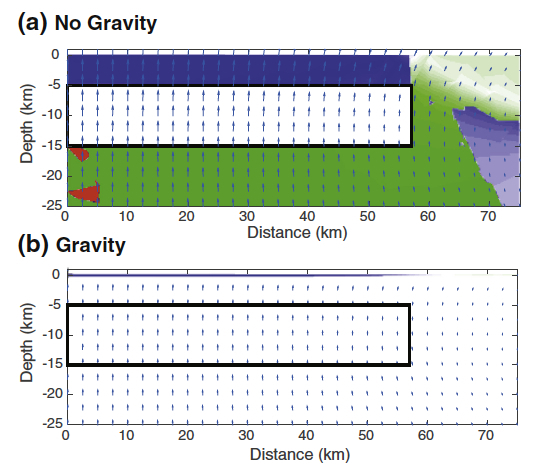 Radial dike formation on Venus: Insights from models of uplift, flexure and magmatism. Icarus, 225, 538-547. — How do pit crater chains form? 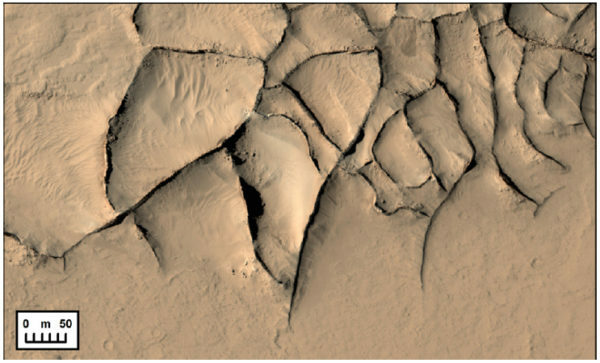 In a 2013 Canadian Journal Of Earth Sciences paper published in a Special Issue recognizing “Canadian contributions to planetary science,” colleagues Sarah Davey, Richard Ernst, Claire Samson (all at Carleton University) and I present an analysis of factors that contribute to pit crater chain formation in several areas of Venus — including the Ganiki Planitia (V-14) quadrangle region mapped previously with the aid of Pomona College students and colleagues (Grosfils et al., 2011). We compare pit crater chain morphologies and clustering characteristics with mapped structures and geomorphological units, and propose that pit craters form above extensional graben covered with friable, possibly volcaniclastic material. 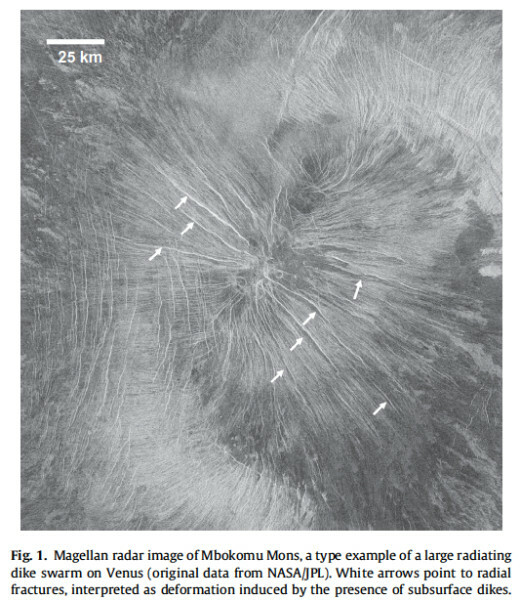 While this hypothesis requires further testing via mapping in other areas, our results are quite exciting because it is difficult to detect volcaniclastic materials on Venus using only Magellan radar data. 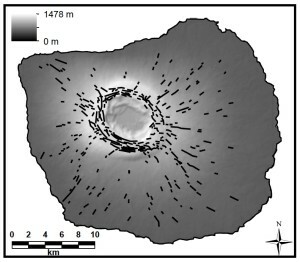 If the proposed link between the presence of such materials and an easily recognizable morphological feature seen in radar data can be confirmed, it would yield a powerful new tool for advancing our understanding of Venusian volcanism and contribute to our general understanding of pit crater chains — an enigmatic volcanic feature observed on numerous planets and moons in the inner and outer solar system. In a 2012 Journal of Volcanology and Geothermal Research paper, colleagues Patricia Gregg, Shan de Silva, John Parmigiani (all at Oregon State University) and I present our analysis of the volcanic conditions needed to form a large caldera (e.g., Long Valley, CA). Supereruptions associated with large caldera growth have caused regional- to global-scale devastation regularly throughout Earth’s recent geologic history, and improving our understanding of how such events occur is thus of obvious societal concern. Utilizing new temperature-dependent, viscoelastic finite element models that incorporate a Mohr-Coulomb failure criterion, we show that eruptive failure of the largest magma chambers is a function of the geometry of the overlying roof and the location of the brittle-ductile transition. 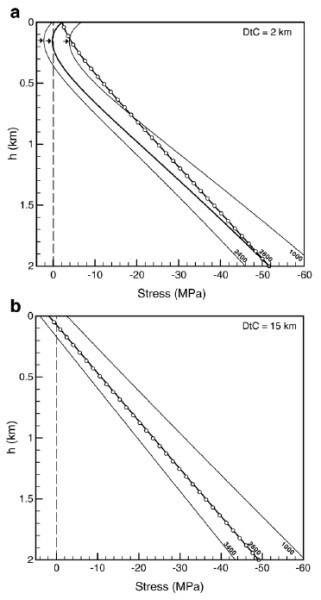 As magma pressure increases within a candidate magma chamber, extensive uplift of the overlying roof promotes fault propagation that can trigger caldera subsidence and lead to supereruption. Our thermomechanical models also provide an estimate of the maximum size of magma chamber growth in a pristine host material and, thereby, an estimate of the maximum size of the resultant caldera. Students: Want to get involved in caldera research?